No need to worry, I know I said there would lots of content to come very soon. Even though I haven't posted much yet, I do have content ready and waiting (it just needs some finishing touches). The reason I've not gotten much posted yet is because we have had not one, but two chickenpox outbreaks here in the Asylum. Just as our son was finally getting rid of his, our little girl (who will be 9 weeks old on Friday) has suddenly sprouted out with loads of them. Any ideas of upcoming posts? Let me know in the comments below! Here's our Square Enix predictions! Vanessa: Kingdom Hearts 3 will be shown. Allan: Think it'll just be a tease rather than a full blown reveal, etc. Vanessa: Hmm... More Rise of the Tomb Raider footage. Allan: They'll show some Deus Ex, and FF15. Vanessa: And now we know about FF7, they'll do more on that. And Hitman, too. Here's our Nintendo predictions! Sorry they're slightly late, we've only just realised the stream has gone live, so have missed some, oh no! Allan: I'm betting for a new Starfox. Allan: New Mario game too. Vanessa: Focus on Nintendo NX. Allan: More characters revealed for Smash Bros, etc. I want Goku! Vanessa: Haha, you wish. I think there will be more "innovation" talk. Allan: Hopefully they show the new The Legend of Zelda game. Vanessa: I don't think they will, wish they would though. Allan: If they want to salvage anything, they'll need to show it. Vanessa: New Pokémon game I hope. Separate to the usual "colour" titles. Allan: Yeah, might talk more about Pokken. Allan: That Tekken/Pokémon type game. Allan: I know I've already said it, but Smash Bros. Looooots for Smash Bros.
Vanessa: New IP. More Splatoon talk. Allan: They might bring back an old franchise too, like Metroid. So what are your predictions? Let us know in the comments below! Well last night we stayed up for the E3 offerings, and my God was it worth it. Since we started Collecting Asylum, I'd have to say that this has been the best E3, in terms of content, that we've had. Yes, we've witnessed the console announcements for the Xbox One and PS4, and yes - with that a whole new slew of games for what was to be our "next gen", but nothing quite prepared us for what we've seen so far this E3. So here are our thoughts so far! So Bethesda opened the conference with Doom (I totally called that one! ), and it looks amazing. Graphics are so good, multiplayer looks fantastic (actually reminiscent of Halo's MP). Enemies looked just as badass and intimidating as they always did. And then Doom Snapmap was revealed. A level editor which allows players to create and share their own multiplayer levels. Great idea, and it looks seriously awesome. Really liked how the ammo drops look after you kill an enemy, very arcade-like. Weapons are diverse, and deadly. Doom will be receiving a Spring 2016 release. For the past year, Betheda explained that they've been working on how to expand on ways to let their communities contribute to games, and use their creative potential, with things like Snapmap, thus Bethesda.net was born - a way for communities to create and share content, take part in forums and gain access to games and new features, etc. Something which we here in the Asylum are really looking forward to. They then went on to show Battlecry. Cool looking game with an interesting art style. Reminiscint of Team Fortress. Will be receiving a beta, to which if you sign up before June 19th, you will get guaranteed beta access plus an exclusive in-game item. Sign up here, now! Arkane Studios comes up in a puff of smoke on screen. DISHONORED II. (Allan called this one). “It’s happened again. Someone’s pulled the rug out from under you” are the opening words to Dishonored 2’s trailer. Play as either Corvo, or Emily Kaldwin. Just like the first game, it's all about choice, and how you choose to progress in the game. Kill everyone you see, or play the entire game without killing anyone. “It’s always good to see a familiar face” end scene of the trailer. Both of us are really excited about this one, moreso Allan - although he does point out that he will need to play the rest of the first one beforehand. Then, they went on to reveal that Dishonored Definitive Edition, for Xbox One and PS4 will be released this fall. No release schedule announced for Dishonored II, but makes sense that it will be a little later than the Definitive Edition, to allow people a chance to get up to speed with the story before the release of II. Another announcement we're very pleased with here in the Asylum. And last but certainly not least, Fallout 4. Fallout 4 looks spectacular. Stunning visuals, brilliant looking gameplay, interesting design... and oh my word. That CE. The Fallout 4 Pip-Boy Edition was shown (and has since sold out at multiple retailers, so I suggest preordering NOW if you intend to get it), and boy does it look good. A wearable Pip-Boy replica (that you can actually insert your smartphone into, with a free downloadable app to make it function like an in-game one, with your actual in-game items, stats, etc), with a display stand, a cool looking box for it, as well as a perk poster, a Pip-Boy pocket guide and a "collectible metal case" Who knows if that will end up being a Steelbook or a Metalpak or God knows what else. Also, if you preorder the Pip-Boy Edition from GAME UK, links can be found here for each format, then you get to join the "Vault Club", and if you are/were within the first 10,000 preorders, you will also receive an exclusive Vault 111 t-shirt. More details below! Available if preordering through GAME UK. And of course, the game itself. It looks immensely awesome. Still in the style of the older Fallout games, but with amazing new features added in, such as building your own houses, settlements, small villages, etc. and the ability to get your dog to retrieve items for you, as well as assist you in combat. The power armour looks fantastic, and I'm interested to see how the game plays out as a whole. 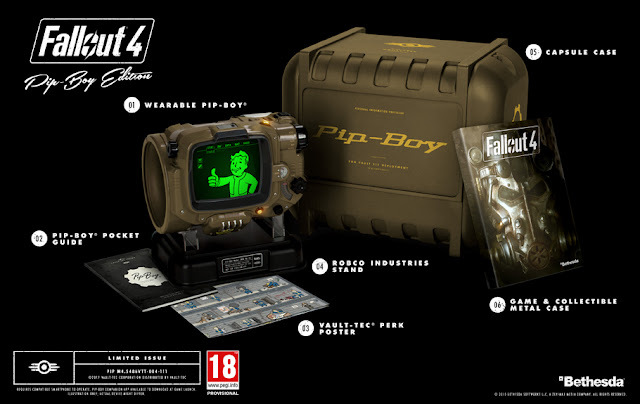 Preordered the Pip-Boy Edition the second I saw it go live on Amazon.com (and then on GAME UK), and so excited for how little time we'll have to wait for it to be released. Fallout Shelter was also revealed, a game exclusive to IOS, which has now totally swayed Allan's decision for his next phone (as he is due an upgrade next month anyway), and I am oh so gutted that it's not going to be on Android too, as I've only just gotten my Samsung Galaxy S5! Also, not sure if any of you noticed, but yeah, I win on my bet of Fallout being kept till the end of the conference, aaand I was closest to the release date (my guess was the 20th, and it's going to be revealed on the 10th November 2015). Overall, we were VERY pleased with Bethesda's E3 offerings. How about you? What were your favourite bits of Bethesda's first ever E3 conference? Let us know in the comments below! Vanessa: More Assassin's Creed coverage, as usual w/ exclusive content. Allan: Yeah, and if so, we'll definitely get one. Been wanting one for ages. Tearaway PS4 coverage. Allan: Yeah, 2015 release date. I'm hoping for a Crash Bandicoot, although unlikely. Vanessa: Yeah, I'd love that. As long as it's like old Crash. Allan: Maybe another Killzone, or something along the lines of inFamous. New game from Insomniac? Vanessa: More Ratchet and Clank footage. Allan: A lot about Project Morpheus, and what games support it. Think it'll mostly be open world, first person, artistic style games. Vanessa: Yeah, more on that rental game thing Sony have going on... the loosely "backwards compatible" thing. So that's our Sony predictions! Just quickly before Ubisoft's E3 conference starts, here are our predictions! Allan: And some kind of party game. Vanessa: Yeah, Assassin's Creed Syndicate will be a main focus, too. Exclusive content for PS4, as usual. Possibly exclusive trailer on PS4 copies for the movie? Allan: Yeah, obviously they'll show a lot of Syndicate. Nice call on the movie trailer. Some form of Far Cry tease, not necessarily 5, but Blood Dragon 2 maybe. Vanessa: Yeah, also focus on that weird AC game. Chronicles, is it? Also think they might show a teaser trailer for the movie, even though it's not a game, if you know what I mean? Allan: Yeah, Watch Dogs 2 reveal as well. Vanessa: Mmm, some more gameplay of The Division I bet. And for some reason I feel like it won't be Aisha Tyler doing the conference this time. Allan: A new IP will be revealed. So there's our Ubisoft E3 predictions! And don't worry about us not posting our EA predictions. We just didn't really have any predictions that weren't the completely obvious stuff, like "they'll show sports games, and Mirror's Edge..." so thought best to give it a miss. We WILL be posting our thoughts on all of the conferences after they are all over. So what are your Ubisoft predictions? Let us know in the comments below! EDIT: Forgot to add in (and thought I'd quickly do so before it gets announced (if it does)) - but Allan also suggested that Beyond Good and Evil 2 will be revealed, possibly with a gameplay trailer. Meant to post this this morning, but now just realised I didn't, with very little time to go! Oops! So here are our Microsoft E3 predictions! Allan: Yeah, to take on Yooka-Laylee, 2016 release. Vanessa: Yeah, just like how the Mega Man Legacy Collection will go up against Mighty No. 9 (or so I think) for release window. I think there will be a huge focus on Oculus Rift, due to the partnership. Allan: It will be able to be used on Xbox One, hence the controllers being released with it. Rather than the controllers just being a PC peripheral for them. Possibly bought OR, rather than just partnering? Vanessa: There will be a quick gloss over of Windows 10, I don't think they'll spend too long on it, but it will be mentioned regarding Oculus, and since it's their next OS so they want to promote, but will focus more on consoles. I *do* however think they'll bring back more stuff regarding SmartGlass, since that pretty much disappeared I think? They'll do more about it, since it could connect in well with Oculus and with Windows 10. Allan: If I'm right about Oculus being on Xbox One, then Insomniac's new Oculus game - Edge of Nowhere - will be on Xbox One, as well as that cool looking game Chronos, hopefully that will be brought to Xbox 'cause it looks amazing and Zelda-like. Steven: There hasn't really been any *big* developers working on Oculus previously, has there? New ones to be announced? Oh well, what about a new Gears of War? Vanessa: Yeah, they're already openly working on it. Gears of War 4 will get a trailer, early 2016 release. Allan: Yeah, they'll start off with Gears of War HD then move onto GOW4. They'll spend a lot of time on Halo 5, too. Vanessa: Yeah, Halo 5 will be the main thing they show. Lionhead to show a new Fable. FABLE FOUR. Allan: Nah, won't be. They said they weren't doing that. Vanessa: Let me hope, damn it. Vanessa: I think that they'll do a fair bit more "indie focus". Especially since that's been so successful for PS4 (via PSPlus). Allan: Also think they'll show more of Rise of the Tomb Raider, and more Battleborn shown from Gearbox. So E3 is upon us, and no doubt with it, a tonne of new announcements to be excited about. And as we do every year, the E3 countdown has us discussing (at length) what we expect - or hope - to be announced, shown or teased with each conference. So, we decided that it would be a good idea to post our E3 predictions, so that we can look back afterwards to see what things we've totally called, or what we've been WAAAAY off with. We have not been reading any leaks, rumours, etc. that are already out there. We may have vaguely seen things pop up online (damn you Facebook), but we have tried to avoid as much as possible, so that 1. We can be properly surprised during E3, and 2. So that we can do our predictions with as little outside info/rumours influencing us as possible. And it's not just mine and Allan's predictions, we also have our friend Steven over so he has decided to give us a few of his predictions, too. So here are our E3 2015 predictions! Broken down as to what we think will be revealed during each conference, and then if we think of anything else, but can't tag it to any one conference in particular. Three points for correct info revealed during correct conference, one point for correct info that's revealed in a different conference to the one we suggest. No points (obviously) for incorrect info. Allan: Gameplay demo for Fallout 4. Steven: Yep, opens the conference, starts with you walking out the vault. Vanessa: Nope, opening the conference with Doom. They'll end the conference with Fallout 4. Saving the best till last. No point showing it first then that's all anyone cares about. Steven: Good point, buuuut Doom could also be considered best, maybe? Online co-op for Doom possibly. Allan: A sequel for a game. Guess what one I'm thinking? Allan: It's one we played the demo of at Gamescom. Allan: Yep, Dishonored 2 announcement. Vanessa: Yeah, makes sense since it's been a while since the first. Steven: I've got a feeling that they'll show another Elder Scrolls. Vanessa: No chance. Elder Scrolls Online has just launched for consoles, and Fallout 4 is their priority. No TES6 yet. Steven: Mmm, I dunno. I think they might. Were Skyrim and New Vegas not shown and/or released around the same time? Vanessa: Can't really remember tbh. Fallout 4 release dates? I'm guessing November 20th, this year. Allan: November 27th, Friday release. So that's our Bethesda predictions, so far. The rest of our predictions shall be posted soon (but had to get Bethesda's up since their conference is soonest). The official return of the Asylum! Woo! First post of 2015 and that's us halfway through the year already - oops! Sorry - once again - for the long absence. Lots has changed for us here in the Asylum since I last posted. Around a month after I last posted on here, I lost my job, and since then we have had to suddenly move house (landlord was selling our old house) and we had a baby! Yes, you did just read that right. Six weeks from finding out to giving birth. Sooooo... yeah, a lot has been going on. But now we're back (from outer space...) and this time we mean it. Lots of content coming both today, and in the future! And to start it all off, here are a few pics of what our new house is shaping up like just now (collection hasn't been moved into the shelves just yet as everything is still spread out between both of our parents' houses) aaaand E3 starts in just a couple of hours, so in just a moment, I shall be posting our E3 2015 predictions! Our room! Apologies for the crinkly curtains, just needed them up as we have workmen outside the windows at the moment haha. This is before the shelves were brought in today, this was *just* after we finished decorating. The other side of our bedroom. Ignore the mattress, we got a new bed so now have a spare mattress, which was just there whilst we had to figure out what we were doing with it. Couch has since been moved to the bottom of our bed as that's where our shelves are now. The shelves are in! Still need to put the shelf inserts in, and then move in all of the collection of course. So what have you all been up to? And what are your E3 predictions?